The Wolves that live in the forest come with a plan to kidnap Masha and demand the Bear to pay a ransom. However the Bear is pleased to find Masha gone and he does not rush the events. Meanwhile Masha turns the Wolves' lives into a hell and they end up paying the ransom to the Bear just to get rid of her once and for all. 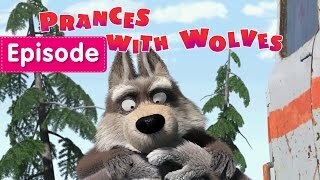 VeClip.com has Masha And The Bear Prances With Wolves Episode 5, funny pictures, movies online, download music, funny jokes, free games and more. Episode 5 Prances with Wolves. The Wolves ... Get latest news from Masha and The Bear. Name: E-mail: * Incorrect e-mail.